The Greek Scout Association (Soma Hellinon Proskopon) commemorated the 50th anniversary of the 11th World Scout Jamboree with a special exhibition in the newly-established Museum of Greek Scouting, on the 6th floor of the building of the Central Administration in downtown Athens (Ptolemaion 1 street). The museum was actually inaugurated on Founder's Day, February 22nd, 2013, with the opening of the Marathon exhibition. Christos Stathopoulos is responsible for the historical archive of the Scouts of Greece and it is thanks to his efforts mainly that the Association finally has a small but important museum it can be proud of. The exhibition will be on during the whole year of 2013. The exhibition presents important documents from the Association's historic archive, souvenirs and unique scout treasures such as gifts given by international delegations to camp officials such as the Camp Chief, Dimitrios "Rann" Alexatos and Crown Prince Constantine, then Chief Scout of Greece. On display is also a Dutch wooden clog hand-signed on location (at the Jamboree) by Olave Baden Powell. On display in the exhibition are four items contributed by our Troop: a panoramic photograph of the campsite given as gift by the Austrian delegation, an empty milk carton issued especially for the Jamboree by the American people, a souvenir Jamboree knife and a official-issue 1-kilo sugar bag imprinted with the Jamboree emblem. The Museum also features a unique collection of staffs and canes that once belonged to Dimitrios "Rann" Alexatos, for many years General Chief of the Scouts of Greece and President of its Executive Board, also member of the World Scout Committee of the World Organization of the Scout Movement from 1957 to 1963. Alexatos, the most recognizable figure of Greek Scouting for many decades, was awarded the World Scout Committee's distinction, the Bronze Wolf, at the 19th World Scout Conference that took place in Rhodes, Greece in the days following the Marathon Jamboree. 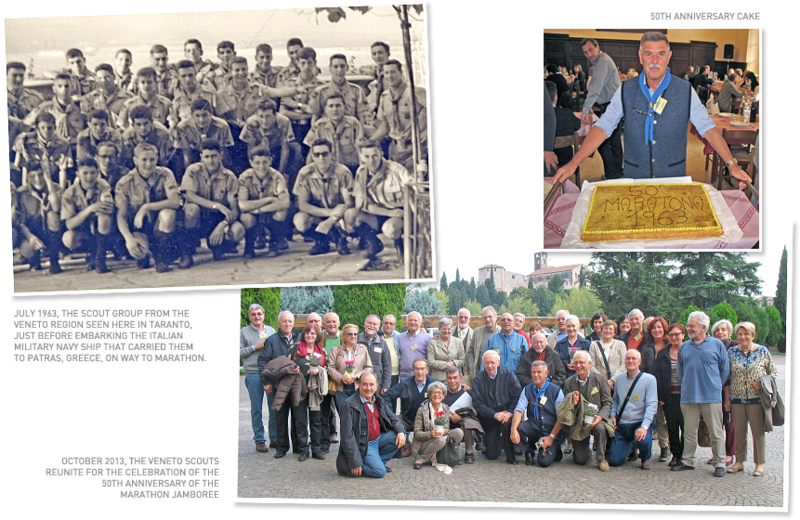 On Saturday October 12th and Sunday 13th October, 2013, 30 senior scouts from the Veneto region of Northern Italy, participants of the 11th Jamboree in Marathon, reunited in Bassano del Grappa to celebrate the 50th anniversary of the event. The team sat for a dinner on Saturday evening, took mass together on Saturday morning as in old times and took lunch again on Saturday before saying goodbye. As Aurelio Tasca conveys to marathon1963.com, "it was really impressive to meet friends that we had not met for 5 decades, remember the Marathon wind, the heat and many other experiences" and closes "we fixed the next appointment for the 75th anniversary; well maybe better for the 55th". At 1:50am on July 28th, 1963, while turning to prepare for landing at Bombay's Santa Cruz airport, the de Havilland Comet 4C of United Arab Airlines flight 869 that was carrying the whole Philippine Scout contingent to Marathon for the 11th World Scout Jamboree, crashed into the Arabian Sea just off Bombay under severe turbulence and heavy rain. The crash took the lives of all 55 passengers and 8 crew members aboard and the bodies were never recovered. 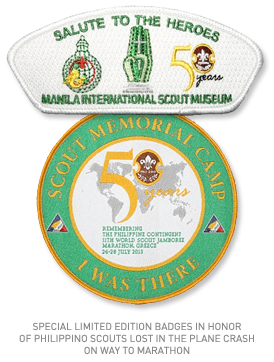 On the occasion of completion of 50 years from the tragic loss of the Philippine Scout contingent, the Manila International Scout Museum issued, earlier in 2013, two special limited edition scout badges. Angelo Manarang, founder and curator of the museum, kindly shared the badges with marathon1963.com (see graphic). On the same occasion, the families of lost Filippino scouts are preparing a commemorative edition in remembrance of their boys for which marathon1963.com is honored to have contributed rare photographic material and information. In fact, another special event was organized 20 years ago in Marathon, in 1993, for the celebration of the 30th anniversary of the 11th World Scout Jamboree. 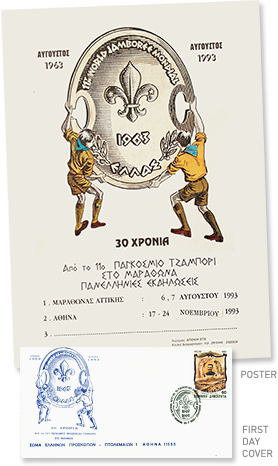 Organized by Alexatos and Paradisis, then vice-president of the Executive Board of the Scouts of Greece, on Saturday, August 7th, 1993 a large group of 11th Jamboree participants gathered again at Marathon. The honorary celebration committee included many government officials such as the Minister of Foreign Affairs M. Papakonstantinou, ambassadors, the Mayor of the City of Marathon I. Bekas, General G. Valis responsible in 1963 for the campsite's technical works, Academy Award-winning composer Manos Hatzidakis, composer of the Jamboree song, M. Lazarimos, Commander in 1963 of ship Ikaria stationed at Marathon Bay, Victor Walker, editor of the "Marathon Courier", Jacques Moreillon, General Secretary of the World Scout Organization, member of the Swiss contingent at the Marathon Jamboree, Thiz Stoffer, President of the European Scout Committee and Alexandros Komninos, President of the Executive Board of the Scouts of Greece. The all-day celebration commenced at 9.30 with the cleaning of the Shinias beach by scouts and with visits to the archaelogical sites of the Marathon fighters tomb, Ancient Ramnounta, Plateae tomb and the Archaelogical Museum of Marathon. After that, many guests went swimming in the bay of Shinias, just as thousand of scouts from all over the world used to, 30 years ago then. The main celebration took place on the afternoon of August 7th, at the Leon Anti hotel in Marathon. In a festive outdoors area the guests had the opportunity to find old friends again, receive the event's souvenir, find philatelic first day of issue covers of the event, sign the commemorative frame, remember the days of Marathon 1963 by admiring the souvenir exhibition, participate in the naming of the Shinias esplanade as "11th World Jamboree 1963 Road", enjoy scout songs and watch an aeromodelling exhibition just like in August 1963. Then everyone gathered around a symbolic campfire where honors and souvenirs were given to special guests, songs were sung and slides from 1963 were projected. The night ended with a festive dinner. On the occassion of the 23rd World Scout Jamboree (Yamaguchi, Japan, 2015), marathon1963.com was commissioned by the Scouts of Greece to prepare what would constitute the national gift of the greek contingent to the organizers. We produced a luxurious large format digitally-printed photo album which portrayed exclusively Japanese scouts in Marathon during the 11th World Scout Jamboree in 1963. The 30-page album was professional constructed by amfotolab.gr of thick cardboard sheets laminated with glossy high-quality prints and included 28 color and grayscale photos. 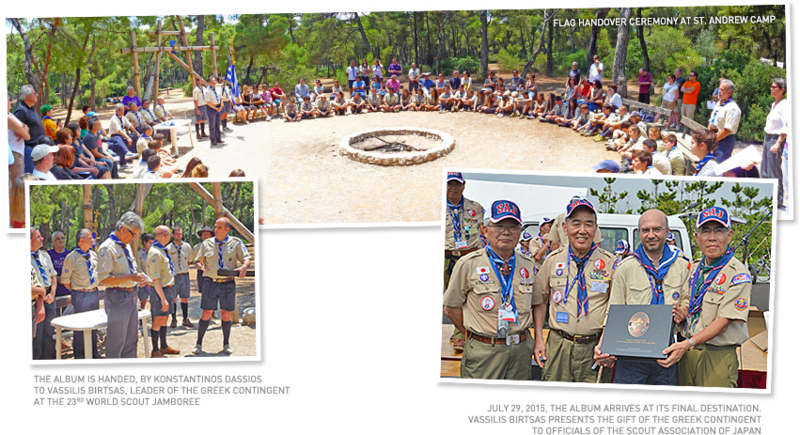 The album was handed to Vassilis Birtsas, leader of the contingent, during the Ceremony for the Handover of the Flag of the Scouts of Greece to the contingent, which took place on June 28, 2015, in the premises of Saint Andrew's Scout Camp in Nea Makri, Athens. The gift arrived at its final destination on July 29th, 2015, when Vassilis presented the organizers with the album. Their reactions were enthousiastic. Marathon1963.com is proud to present, below, an electronic copy of the photo album. Flip the album by lifting the corners while holding the mouse, or use the slider to browse.